For groups of over 6 persons, cancellations must be made at least 48 hours in advance, or the equivalent of one night's stay for all persons in the group will be charged. Old Town boasts an unbeatable location - we are the only hostel within the walls of Diocletian's Palace, a Roman imperial structure from the 4th century AD protected by UNESCO as a World Heritage Site. Within a stone's throw from the hostel you'll find all the major tourist attractions as well as the best bars, restaurants, cafes and shops in town. Our newly renovated and refurbished dorms and private rooms are all air-conditioned, and dorms come with backpack-size safety lockers. 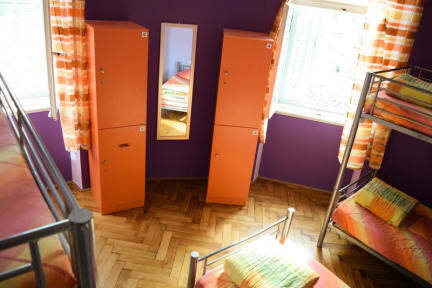 Note, the 4 bed has smaller lockers. Facilities include free WiFi, free towels, laundry service, kitchen facilities, cable TV, book exchange and board games. We pride ourselves on our friendly and knowledgeable staff. We'll gladly provide travel information, help you organize your next stay or transfer, take you out for a beer to our favorite bar or just show your around town. Dinners, nights out and other activities are organized frequently with partner hostels. *Tourist tax of 10kn per person per night is not included in the price.